121 Collection on Whitley. Ready for occupation | Hotline +65 6750 4677. TOP obtained. Units start from $5.5 mill. Presenting 121 Collection on Whitley. A treasure trove of nine premium landed homes that are anything but ordinary. Every house is thoughtfully designed and immaculately configured with a distinct lifestyle in mind. No two are the same. Like precious gems, each home touts a style of its own and an exclusive world of spatial experience shared by no other. 121 Collection on Whitley. Truly one-to-one luxury living as exquisite as you. Our vision is to create one-of-a-kind homes that transcend luxury. The 121 Collection on Whitley proves that even semi-detached houses do not have to conform to symmetrical design. While all nine houses feature different designs and floor plans, they come together as one fabulous collection, resplending with the shimmering beauty of paradox. Enjoy the precious freedom to bond with Nature, without borders. On the ground floor of every house, pillars are boldly discarded so that you have virtually borderless space. Perhaps the only thing that segregates you from the greenery out there is the house’s expansive glass facade, a design idea that brings exquisite living interiors and the great outdoors in symbiotic harmony. You’ll also notice that no two facades are the same. Semi-detached houses are customised to look like individual bungalows, illuminating dazzling characteristics shared by no other. Coming home is an uncanny feeling of stepping into a garden, where you are endlessly showered with the luxurious gifts of Mother Nature. Setting free creative imagination and groundbreaking architectural sophistication, the essence of garden-living is brought right inside the house. Natural light, wind, greenery and water, the ecosystem’s core elements are woven into the living space, creating a priceless sensorial experience and an unusual masterpiece of urban living. 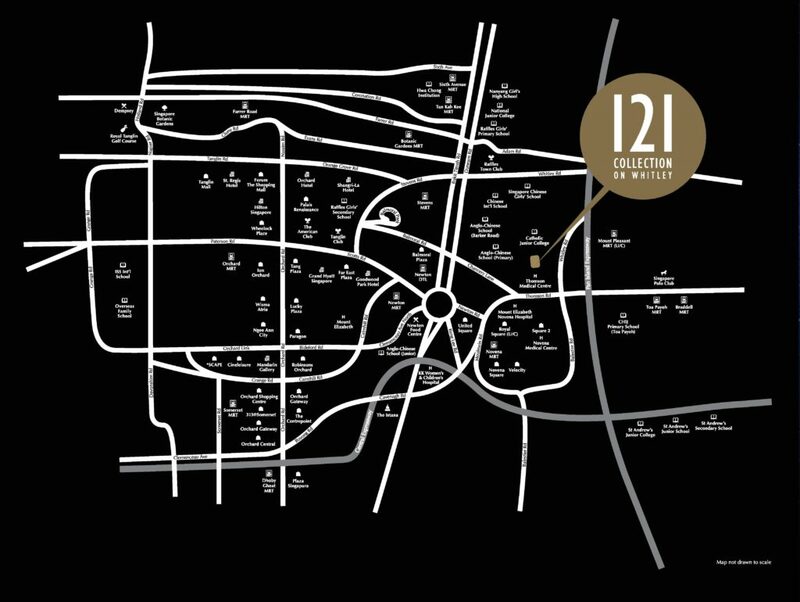 Inspired by dreams and fantasies, 121 Collection on Whitley is a world of architectural masterpieces that goes beyond expectations. Every house is a treasured gem on its own, each with its sparkling secrets and little surprises to unravel. Just How Welcoming Is Home? Browse a magazine, leaf through a book or chill-out to your favourite tunes. Whatever you do, enjoy the good company of Mother Nature. Through the panoramic glass wall that opens up the living space for a seamless flow, you can embrace the great outdoors even in the sheltered comfort of your living room. Home is one with Nature. Even the air you breathe seems fresher. Enter a sanctuary where space overflows. This is your own private world that lets your senses experience pure comfort every day. Rest amidst a master bedroom so spacious that it spreads across almost a whole floor. Find pleasure in your very own luxurious walk-in wardrobe that can house your priceless collection of lavish fashion finds from all over the world. In your entertainment room and cocktail lounge in the basement, be dazzled by a magical theatrical sight. Orchestrated by clever architectural manoeuvres, spectrums of sunlight interact with the shadows of water, producing luminous visions that dance ethereally in space. Dramatically, the entire room comes alive to illuminate your mood and day. You know it’s an enviable address when the best of the city is at your doorstep. Shop at Orchard Road. Dine and wine at Dempsey Hill. Or take a walk at the Botanic Gardens, a UNESCO World Heritage Site. Novena and Thomson Medical Centres are just a stone’s throw away. With almost instant access through the upcoming Mount Pleasant MRT and major expressways, a world of indulgence, recreation and convenience is always at your beck and call. Parents will also be pleased to choose from numerous prestigious schools that are also nearby. 121 Collection on Whitley	Overall rating:	0	out of 5 based on 0	reviews.